One of the primary reasons P. larvae is so difficult to control is the bacterium’s ability to become dormant and form a spore by developing a thicker, protective cell wall that allows it to withstand extreme environmental conditions. P. larvae spores can remain in a dormant state for up to 70 years before “germinating,” or becoming active and infectious again. Spores are resistant to high temperatures, dry conditions, many harsh chemicals and treatment with antibiotics. 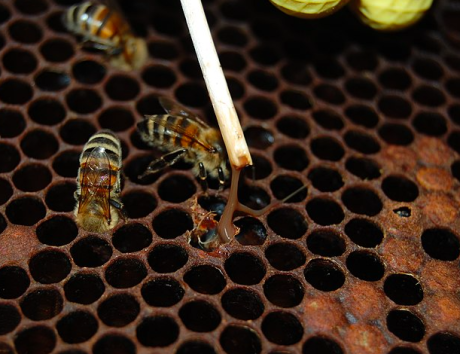 They only germinate when they find themselves in the gut of a honey bee (Apis mellifera) larva. Upon germination, P. larvae begins reproducing and kills the larva in a few days. But what if you could prevent P. larvae spores from germinating? If you could identify the event or factor that triggers germination and block it, you could prevent infection. Alvarado and other researchers in the lab of Ernesto Abel-Santos, Ph.D., had used this approach to prevent the germination of other bacteria including Clostridium difficile, which causes a debilitating and difficult-to-control gastrointestinal infection in humans. Previous research on bacterial spores had shown that germination is triggered when specific molecules, called “agonists,” bind to a special receptor molecule on the cell membrane that surrounds the spore. The agonist acts like a key sliding into a lock, causing the lock to turn, and allowing the door to open, or in this case allowing the spore to germinate. One way to prevent this is to use an “antagonist,” a molecule that binds to the receptor but does not trigger germination. An antagonist is like the wrong key for the lock. You may be able to insert it into the keyhole, but it doesn’t turn the lock. Then, it gets stuck in the lock so that you can’t pull it out and use the correct key, or agonist. Now you cannot open the door or, in this case, germinate. Research in the Abel-Santos lab showed that the molecules indole and phenol act as weak antagonists for P. larvae‘s germination receptor. In the research reported in Journal of Insect Science, the researchers tested a variety of indole and phenol analogs (molecules very similar, but not identical, in structure to indole and phenol) in the hope of finding a stronger antagonist. They then went on to determine the optimal amount of analog necessary to prevent P. larvae germination, assess whether the analog could inhibit reproduction of P. larvae that had already germinated, and whether the analog would be effective in a lab-reared bee larva. Their tests determined that 5-chloroindole was an effective antagonist. This compound was not toxic to the bee larva, but it inhibited P. larvae spore germination and bacterial proliferation in vitro. When bee larvae were fed a diet containing 5-chloroindole, they were better able to survive exposure to P. larvae spores. Alvarado and his colleagues’ work has shown that 5-chloroindole could prove an effective treatment to prevent AFB in honey bee colonies. An alternative to the antibiotics currently used is needed because these drugs can harm beneficial bacteria in bee larvae guts. In addition, some strains of P. larvae are evolving resistance to antibiotic drugs. Still, much works needs to be done before beekeepers can start using 5-chloroindole. A practical method to get 5-chloroindole to the larvae must be developed—for instance, as a food supplement for the colony. 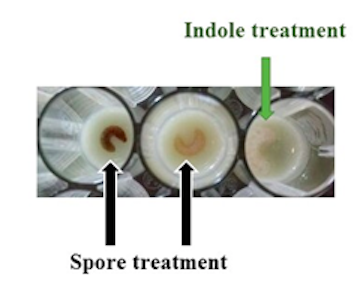 In addition, researchers must determine how long 5-chloroindole persists in the wax and honey stored by a treated colony. Nevertheless, it is a promising development in the battle against AFB. If the researchers find continued success, beekeepers may soon be armed with a more effective, less drastic treatment for AFB, and fewer bee hives will be sent to the burn pile. 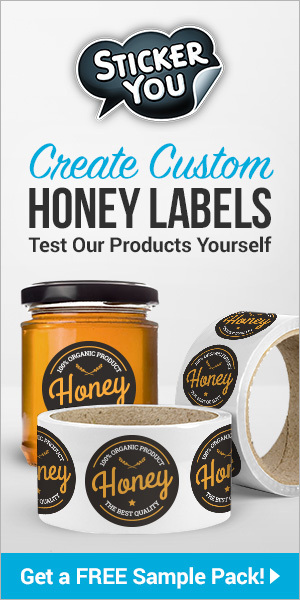 Previous articleCATCH THE BUZZ – In June 2014, Rwanda Was Among Third Party Countries Accredited To Export Honey To The European Union Following A Rigorous Process By An EU Accredited Lab. Next articleCATCH THE BUZZ – When livestock, fish or insects are being transported, they need to reach their destinations quickly. New Law may change that.